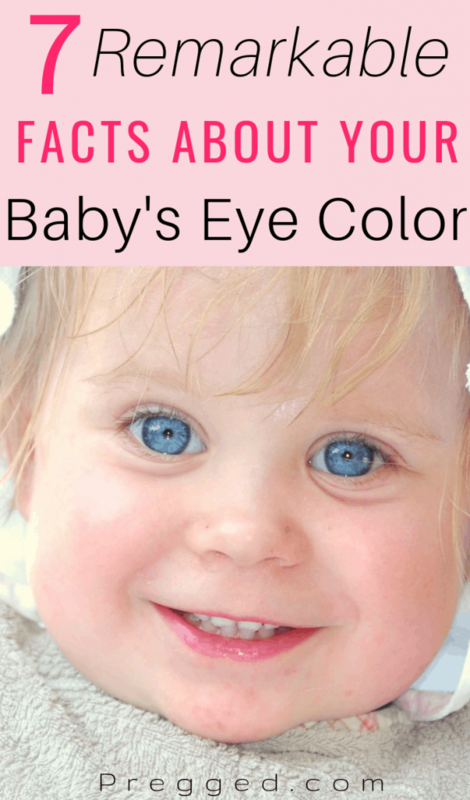 A very common question new parents have is what their baby’s eye color is going to be. It’s hard to tell what color the eyes are when your baby is very young. And to make it even trickier your baby’s eyes will usually change color in the first weeks and months. Can baby’s eye color be predicted based on their parents eye color? Is there any other way to predict their eye color? Are there any indicators of health issues you need to look out for in your baby’s eyes? Here we answer your questions as we share some fascinating facts about newborn’s eye color that you may have not heard about before. The part of the eye that varies color in the eye is called the iris – and the iris is a muscle! Eye color is determined by melanin, the same protein that gives color to skin and hair. The pupil is the hole in the center of the eye through which light comes in. Pupils are normally black because they are, literally, holes. The iris adjusts the size of the pupil according to the amount of light perceived by the eye. In the presence of bright light, the iris makes pupils shrink to control the excess light coming in. In the dark, the iris will make the pupil size bigger so that more light can come in and allows the eyes to see better even if it’s dark. When a baby is born their eyes will most likely look gray or dark blue (or blueish). They may even have a silver shine to them. This color does not determine the final eye color. The baby’s eyes will develop for some more time before you can tell the final eye color. Melanin develops in response to light. Since newborns have been for many months in the womb where there is no light, melanin development is not complete. As your baby is exposed to light, melanin production will increase, and eye color will continue to change. Some babies will develop their mature eye color faster than others. Some babies will have their eyes become brown in just a couple of months. This darkening process will then slow down, but probably continue to slowly darken even more until the baby is about 9 to 12 months. Like mentioned above, melanin is the pigment of eye iris. The way it works is that the more melanin is produced in the baby’s iris, the darker they will be. Melanin is brown, there is no blue and green melanin. Eyes start out blueish which means there is little to no melanin in the iris. As more melanin is produced, eyes will start to look green. A bit more melanin added to green eyes will give you hazel eye color. If you take hazel eyes and produce even more melanin, you get brown eyes. Brown eyes start in a gradient of very light brown to medium brown, then those with the most melanin will be deep dark brown. That said, the sequence in which a baby’s eye color changes means when a baby’s a color matures, it becomes darker. Newborns with dark eye color will not normally become lighter. That also means that babies born with light eye colors will darken to some degree before their first birthday and won’t become any lighter over time in normal circumstances. I have to tell you straight up. You cannot accurately predict the final color of a baby’s eyes until they are done developing and eye melanin production has stopped. It takes about a year for the iris’ melanin to finish developing! So, you really cannot tell what color the baby’s eyes will finally be until at least they are one year old. However, the color change slows down significantly after the baby is 6 to 9 months old. Don’t let anyone sell you some eye color predictions thing. (Unless, of course, you understand that it would be mostly for entertainment and that predictions may be really off). A fun way to roughly estimate if a baby’s eye color will darken to brown is to take a good look at the eyeballs. You won’t want to shine a bright light at their face because that is uncomfortable, and they will probably close their eyes in response. But on a nice bright day, take a close look at their eyes. If the newborn’s eyes are very light bright blue, there is a higher probability of their mature eye color being any shade of blue, or in the green eye color spectrum. Newborns that have darker grayish, or dusty/cloudy looking blue, are more likely to darken all the way to hazel or any shade of brown. I remember in 5th-grade science class drawing a Punnett square to predict what would be the color of my future offspring (with hypothetical husbands at that time). Even though eye color is determined by genes, it is not as simple as 5th-grade biology made us think. Turns out there are more genes involved in the determination of eye color than we originally thought. For simplification and academic purposes, it is sometimes taught in school as the mere result of the Punnett square. Good old Punnett square of eye colors? Well, it is not very accurate! 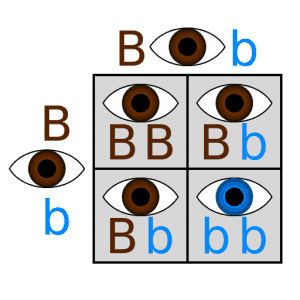 The Punnett square shown above is used in to estimate the probabilities of a genetic trait passing on to offspring, based on the parent’s traits. This can be a great example to teach basic science students the way some genes are inherited, but it is not that accurate for traits that are controlled by multiple genes. 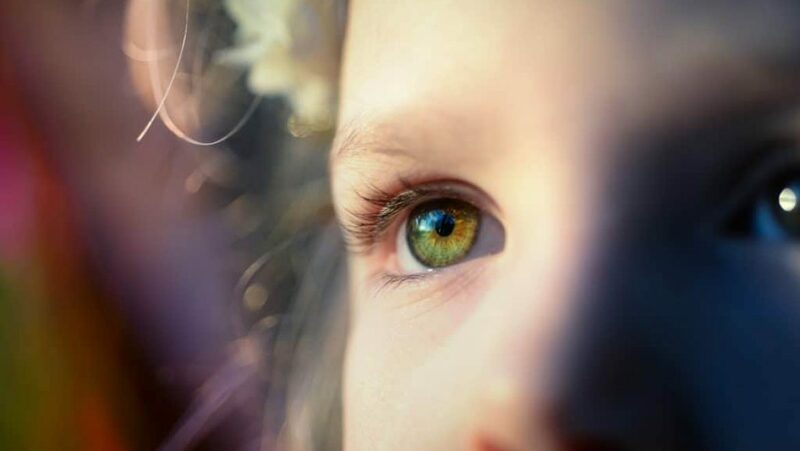 In the case of eye color, it is estimated that there are upwards of 16 different genes that influence what the eye color of a newborn will be. All these genes interact with each other in different ways for the final eye color. Following the genes line from the fact above, in general, when both parents have light-colored eyes (eg. blue), there is a good chance that their baby will have light-colored eyes as well. Also, when two people with dark-colored eyes have a baby, there is a good chance the will have dark eyes too. In both cases, there can be babies with eye colors that differ from that of their parents. That is a good example of when our friend the genetics Punnett square becomes handy (see above). 7. Unusual eye colors that can suggest possible medical diagnoses. There are some unusual eye colors that warrant investigation for possible undiagnosed medical conditions. Here are a few examples of these abnormal eye colors and what they could mean. Heterochromia refers to people who have one eye of a different color from the other. Kids with heterochromia may have one brown eye and one blue eye. People with heterochromia should consult their doctors to evaluate for rare genetic conditions. Some people have simple heterochromia, which means that the two different eye colors are the only unusual thing about them, and nothing else is affected in their body. This usually is the result of a problem that occurred when the lighter eye was developing. Waardenburg syndrome is a genetic disorder that has various manifestations but, in some babies, may manifest as one blue and one brown eye. Leukocoria means white pupil. Babies can be born with one or both pupils that look white or have them turn white later. The pupil is the black hole in the center of the eyeball that allows light to come into the eye. White pupils can be a sign of cataracts. This happens when the lens, which is normally a clear structure in the center of the pupils. There are many reasons for babies to develop cataracts, but the most important thing to know is that it needs prompt evaluation. When babies are in the newborn nursery, they are routinely checked for cataracts by the pediatrician before going home for the first time. 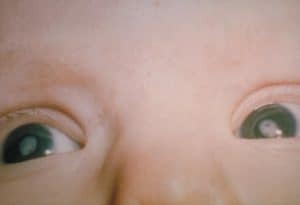 Developing Leukocoria later in childhood can also imply other health problems other than cataracts, so it’s important to let your child’s pediatrician know if you think you are seeing this in the baby. When the white part of the baby’s eye looks yellow, it is said that their sclera (white of the eye) is icteric (yellow). This usually happens when babies have jaundice. 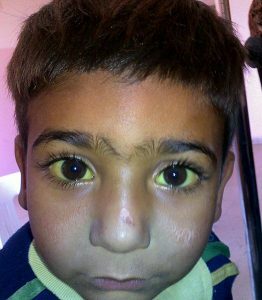 Jaundice is the yellow discoloration of the skin due to elevated bilirubin. All newborns have slightly to moderately elevated bilirubin during the first days of life, and it is usually most apparent in the skin of the face. One of the last body parts that turn yellow is the white of the eye (sclera) and usually signals that bilirubin may be significantly elevated. There are many reasons that can cause babies to become deeply jaundiced, and some levels of very high bilirubin can be harmful to the baby. Tell your baby’s pediatrician if you think your newborn has jaundice. There are rare genetic conditions in which babies are born without the iris part of the eye. If you recall from above, the iris is the part of the eye that usually gives it color (brown, blue, etc.). So, babies born without an iris are said to have aniridia. They don’t have the colorful part of the eye. These eyes look all black in the center. Aniridia can also be partial, in which the baby is born with only part of the iris, so the pupil (black hole in the center of the eye) appears oddly shaped. When someone has aniridia, almost always they will have some other health problems in the eyes and sometimes in other body parts. Kids with aniridia need close medical follow up until their doctor says otherwise! It’s fun to speculate what the final eye color of babies will be, but no prediction method is truly accurate. So, I encourage you to enjoy every second of staring into your baby’s eyes and just wait until they’re about 9 to 12 months to know the final color for sure. You will probably have a good idea of what color they are going to be with the changes that happen in the first 6 months, but don’t make any huge life decisions based on that color alone, because they will slowly change some more. That goes for those planning to name the baby “Blue” based on the apparent eye color alone, although I’m sure that name would fit a lot of people regardless of their eye color. Also, remember that although rare, some babies will be born with eye colors that suggest a medical problem, like some of the examples I mentioned above. While you are at enjoying your new baby, don’t forget to ensure you’re baby has a safe sleeping environment. I highly encourage every new parent to read or review the 11 ways to reduce the risk of SIDS because safety is first! 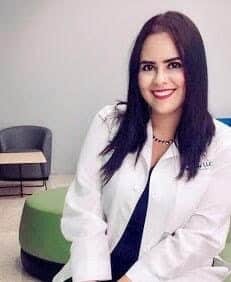 Dr. Charlene Fernández-Camacho is a practicing, board-certified pediatrician. She writes the blog serenitychildren.com with tips for parents to raise healthy and happy kids.